Sonnet's eGFX Breakaway™ Boxes are a family of Thunderbolt™ 3 to PCIe card expansion solutions that support any Thunderbolt compatible PCIe card, but are designed specifically for bandwidth-intensive AMD and NVIDIA® graphic video cards. The eGFX Breakaway Box 650 features two 8-pin (6+2 pin) auxiliary power connectors; supports cards requiring 375W of continuous power plus an additional 100W peak power (equivalent to 750W recommended system power); and provides 87W of upstream power, useful for charging your notebook. AMD approved for the air-cooled editions of the AMD Radeon RX Vega 64, Vega Frontier Edition, and Radeon Pro WX 9100, this model was designed and qualified to also support overclocked NVIDIA cards with high peak power requirements. 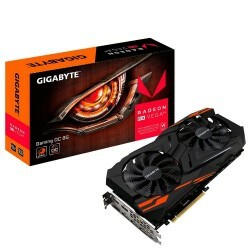 Depending on your OS, there's a graphics card suitable for your needs. 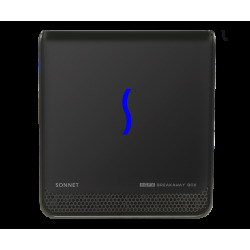 Sonnet's eGFX Breakaway Box 650 Bundle includes an Gigabyte Radeon RX VEGA 64 Gaming OC 8G graphics card, providing GPU support for computationally-intensive applications and games on compatible Mac® and Windows® Thunderbolt 3 computers. The coolest and quietest graphics card expansion systems on the market, eGFX Breakaway Boxes feature a large variable-speed, temperature-controlled fan that quietly and effectively cools the installed card – perfect for noise-sensitive environments. For professionals, the Breakaway harnesses the computational engine in today's GPU cards that are accelerate special effects, animation, color grading, rendering, and editing. For gamers, the Breakaway Box is ideal for enabling graphic-intensive gaming on computers (such as thin/light notebooks) that otherwise would not be able to produce an acceptable gaming experience. Additionally, the eGFX Breakaway Box supports graphics cards with 120mm water block coolers. Water block coolers run quieter than active fans; plus water block coolers enable higher overclocking. 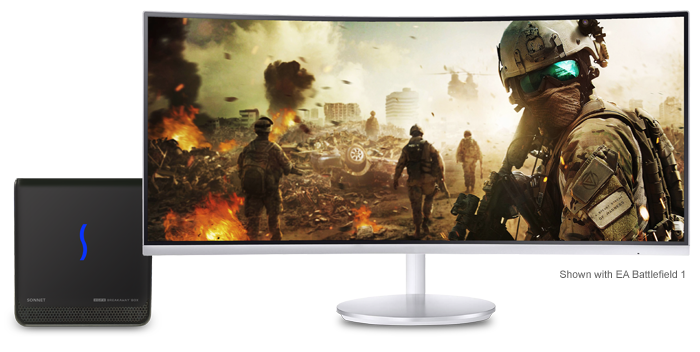 Sonnet's eGFX Breakaway Box 550 Bundle includes everything you need to get started with high-performance graphics acceleration. Alternatively, if you need a cost-effective Thunderbolt expansion system for a Thunderbolt-compatible, non-GPU PCIe card (such as the Avid Pro Tools|HDX [power adapter cable sold separately] or RED ROCKET-X), simply swap out the included graphics card and utlize the Breakaway Box as a cost-effective single PCIe card Thunderbolt expansion system with your computer.